No this isn’t my cake, but it’s one of the simple ideas I’m about to write about. When shopping for your cake be careful of the ‘extras’ they provide you. There is no way in hell gerbera daisies cost 45 bucks anywhere, so why should I let a bakery charge me that? Anton and I even toyed with the idea of making our own cake. That was exciting for about 10 minutes. Until I realized I can’t bake to save my skin and I wanted people to actually eat this thing. Plus I have absolutely no baking accessories and after buying all of them to use once, I’d be over budget already. I have some great ideas for getting the right cake for you at the right price. 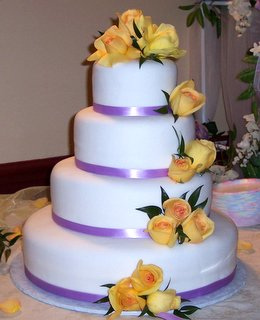 First find a picture of the cake you want for your wedding. Then go to every bakery in your area that makes cakes. Get the price of a basic cake, the flavor of your choice, with no frills and either fondit or cream frosting. Go out and buy all of the accessories for the cake like; flowers, ribbon, cake topper, and any other decorations you like. Delegate to someone in your wedding party (or anyone willing to help) that it’s their job to decorate the cake when it’s delivered to the reception hall. Make sure the cake will be hidden in the kitchen until it’s finished. Decorating it should take all of 5 minutes. Make sure what you want is relatively simple so it’s easier on the person decorating it. Decorating the table also makes a simple cake look dazzling. You can make your own candies to put on the cake, or cake alterative, by melting colored chocolate and letting it cool in a stencil rack like this. Go to this link and scroll down. You’ll see some amazing creations you can easily do yourself. 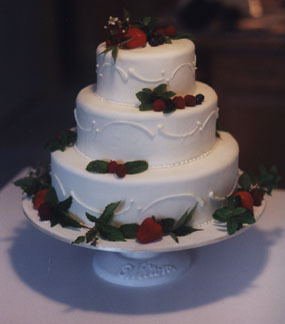 If you do want an alternative wedding cake, go to your local bakery and ask to rent the tiers with nothing on them. Get all of the cupcakes, donuts, or whatever you chose to stack on them and do it yourself. You may want to get it a few weeks in advance to practice. 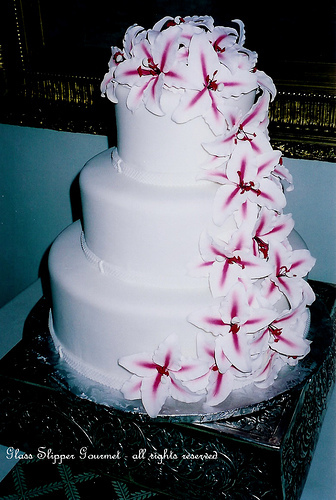 Practice icing and decoration arrangement and take a picture to show your helper so they know exactly what you want on your special day. Make it a fun girls night event or make it special with your fiance/fiancee. I love the idea of incorporating fruit or sweets on the alternative cakes. It ensures that everyone gets some. Also check out fellow blogger Deborah at The Humble Housewife for great dessert recipes that you can incorporate into your wedding cake. She’s a wealth of information and extremely good at what she does. Just looking at the pics on her blog make me hungry. MMmmmmm strawberry shortcake.